Mother's Day is right around the corner, at the end of the month! This year marks my fourth Mother's Day and my first since becoming a mother of two just ten days ago. To mark the occasion I've teamed up with Hotel Chocolat to write a post all about my favourite Mum moments and to give away a Hotel Chocolat Sleekster to one lucky reader. If you'd like to win make sure to read the post and enter below. There are so many special moments which spring to mind when I think about motherhood and my children. From all the first's and the milestones through to watching my son grow into the sweetest soul over the past three years. There was so many moments like those to choose from that I had to go with the monumental moments, the day my children were born. Seeing my babies and holding them for the first time was everything I ever imagined to be, totally overwhelming. With my son I was given drugs in labour so I was a little spaced out when he was born but I remember that instant love flick on inside me like a switch, though a little bit foggy! I gave birth to my daughter just ten days ago and although her labour was very difficult I was a little more with it when she made her appearance into the world. Everything was so clear and the familiar searing love flooded through my veins, there really is nothing like it. I wish I could bottle up that feeling and sell it, I would be a millionaire! Besides the birth of our daughter I experienced another very special moment last week. 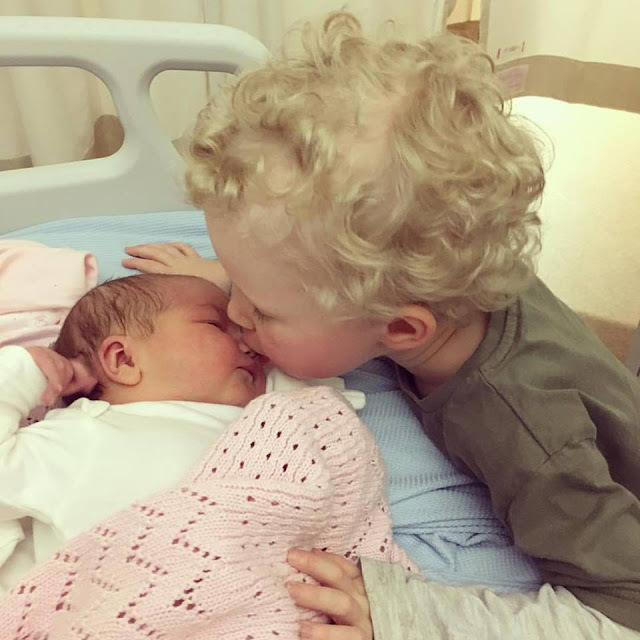 My son meeting his sister for the very first time! All throughout my pregnancy I continuously thought of ways to make the big life event as easy on Noah as I could. I included him in everything and spoke about my bump and his baby sister often but not too much that it was all he heard. I also bought him one of his favourite toys as a present from his baby sister. When he came to visit us at the hospital it was the morning after she was born as we'd had to stay over night. I hadn't seen Noah in two days with my long labour and hospital stay so when I saw his Spider-Man wellies approach my cubicle I couldn't help but feel a little choked up. He must have felt the same because as soon as he saw me his bottom lip wobble and he climbed right into my arms. I gave him the biggest cuddle and told him how much I'd missed him and how much I loved him. Once he was comfortable I told him to look behind him as his little sister was there and really wanted to meet him. I had her all wrapped up in her cot and when he saw her he smiled. I didn't force him to go and see her and he happily sat on my lap whilst I introduced them to one another. He then shared some ever so sweet moments with her which I managed to get on camera. Ever since he's been very gentle and often refers to her as "his baby" or "baby Ava." I can't wait to see their relationship grow as they both get older, sibling squabbles and all. Hotel Chocolat is my absolute favourite chocolate and their range of Mother's Day chocolates are out of this world. They kindly sent me one of their Mother's Day Sleekster tray to indulge in over the Mother's Day weekend and I have to admit that I've tucked into them already! The Mother's Day Sleekster costs £22.50 and contains 27 chocolates from truffles through to florentines. How would you like to win one? To enter all you need to do is use the Gleam form below. Good luck and don't forget to enter my other blog competitions! 1. There will be 1 winner who will win 1 Hotel Chocolat Sleekster. Just the little every day things, everything that makes me smile! seeing my Daughter become a Mum, she is an awesome Mum to our little Grandson and we are so proud of her. When I brought home my second child my main hope was that my first child wouldn’t hate her (and me). I also hoped he wouldn’t smother her if I left the room and wouldn’t throw matchbox cars at her head. Never did I imagine that they’d actually like each other! If there is one thing more adorable than the uncontrollable giggle of a small child it is the uncontrollable giggles of two. Especially when they are laughing at each other. He loves nothing more then playing with and watching over his little sister. Makes me so proud. Becoming a mam for the first time! I gave birth to my first and eldest son naturally and held him in my arms within seconds of his birth – it was magical! Many over the years but I would always enjoy when it rained and we'd go for a walk putting whatever we had over our hair(once a plastic carrier bag). Nothing ever stopped us venturing out! There has been many, but my favourite all time was when Jack giggle for the very first time, it was infectious and thats when I fell in love with the sound of his laughter. Probably being at my child's birth and watching my wife become a mum, with my own mum there for support as well. My 2 favourite mums! Nothing makes me feel better than a hug from my Mum! I hope that one day you do have a Motherly Moment. Luckily I still have my Wonderful Mother. Though at 5 years of age my Dad died suddenly of a heart attack. His sister was emotionally close to my family. I recall gifting her God -Mother items on Mothers Day, as I believed it could express that I appreciated her Care, Love and Emotional Support etc that she lavished on myself and my family. Thank you. Hopefully one day. I'm so used to just relying on myself & not having that 1 person that I can trust 100% but also think it has made me a much stronger person. Sorry to hear about your dad. How lovely for you to have kept a close relationship with your aunt though. I think that would have to be when I had my first baby and my mum was there as well for her first grandchild. I have so many happy Mum moments, but one that always stands out is when we surprised the kids with a day out at a theme park. They thought we were going on a picnic and that we 'made a wrong turn' going into the car park, but they twigged when we got out of the car & started heading towards the entrance. I will never forget the happy squeals from that day. My favourite mum comment is "if you watch any more TV, you'll get square eyes"
when my daughter was born and how emotional and happy my mum was! Whenever my daughters tell me they love me. My eldest is nearly 10 and it never gets old - it makes all the hard times worthwhile! One of my favourite mom moments was when my son was 6, half way through his Christmas assembly, he stopped the performances, waving at me with a big smile on his face. My heart just melted. He looked so proud of himself. My Mum loves to sing, even though she's a bit tone deaf and can never remember the words so just makes them up. I always picture her singing to herself in the kitchen on a Sunday morning. My mum and I going on holiday together to Madrid. We had so much fun and my mum riding a bike was so funny! Far too many moments to choose from, I have many happy mum memories. Hugging my sons when I towered over them and now being hugged by them when they tower over me. When my little girl comes to me and tells me (without prompting) that I'm 'the best mammy ever.' Balm to my soul as I sometimes feel so useless at everything, especially dealing with her older brother who has ASD. Days when there are no planned kids activities and we can just chill out. i.e. one voice at a time. Respectfully not disturbing others etc e.g. In library etc. When I read to my chide at bedtime. Quality time with a goodnight kiss and a big hug. Daily reminder of how lucky and blessed I feel. My favourite mum moment is when my kids became mums too. My Mum Moment was when my daughter was born and I seen her face for the first time and the feeling of overpowering love that washed over me. The first time I held my son and gazed into his beautiful blue eyes. Like you, I had a very difficult labour when my daughter was born just over 27 years ago and I still remember that feeling of instant, total, overwhelming love the moment I saw her. She died shortly after birth and was officially dead for 24 minutes and the agony I went through during that 24 minute lifetime is sitll undescribable, but joyfully the amazing paediatrician managed to resuscitate her and the relief at hearing her cry again was a giddy moment and I shall forever be grateful that the paediatrician refused to give up on her. I only ever was able to have one child and I was indeed blessed with an angel who is now grown up and married and lives not too far away and still loves coming to vivit her mum whenever she can for hugs and chats and she will forever be my baby. Watching my daughter play the violin and feeling so proud. My favourite mum moment was hearing mama for the first time. First hearing my son say Mama. Mine was becoming a mum two my two beautiful children. Every day there is a new best mum moment! Watching my 2 & 6 year olds play nicely together! I have so many lovely Mum moment memories but one is very special. It was when we brought my daughter home from hospital and for the first time me, my daughter, my husband and my son (who was 2 years old) were all cuddled up close together on the sofa. I couldn't believe how incredibly lucky I was. Has to be those first steps!! unexpected cuddles are my favorite thing. Those new milestones and proud mummy moments, who knew how proud you can be! Awww how beautiful she is! Congratulations on your new little treasure. Has to be getting a nice suprise of them especially when they are so excited to show you it even if it is something simple as a drawing it still lovely. My favourite mum moment was when I managed to take my five children to Disney World Florida after saving for seven years. There faces just made it the most wonderful experience. The smiles, the giggles, and watching a face full of fascination as our wee one discovers something new! There is no favourite. all the moments I had with my mum were mum moments. Last week when my daughter got moved up to stage 3 of swimming after nearly a year in stage 2. She was so proud and smiling from ear to ear. All the times she sacrificed her own needs for ours. There were so many. I have three. Each time I waited months to meet my three daughters, it was excellent despite the pain of labour to finally get to hold them and express my love. It's just an amazing feeling that only a mum can understand. Eating one of my mum's cakes. Packet mix but still awesome. So so many, watching my eldest graduate university with a 1st, seeing my son pass his theory test and my middle daughter getting a job. So many more though. Seeing them becoming strong, independent adults. When my kids just randomly come our with "I love you mam" and you know in that moment they were really thinking about how much they love you. My Mums been through such a lot in these last few years. But even during some of her harder times, she's always been there to support me through my own highs and lows. When we have a really good day with no tantrums or misbehving and people comment how lovely my kids are! There are so many beautiful moments that it's hard to pick a favourite but I'll never forget the love I felt when I saw my son for the first time. I waited a long time for him. My daughter growing up and becoming a wonderful mum! Well, I have too many to count. But one was when my autistic son asked "why," for the very first time. He had only made statements, not actually asked "why," about anything. Then one day, he did ... and then he didn't stop! That was when he was 6 and he's 10 now and doesn't stop asking questions, which is brilliant. In all honesty, I have far too many favourite mum moments that I could never just describe one. I absolutely love being a mum and have favourite moments with my girls countless times each day. They make me so proud to be a mum!